I turned 21 last week, and what better way to celebrate than at "the world's biggest party"? Carnaval is the "holiday season" in Brazil - a time where people dress in crazy costumes, cover themselves in glitter and celebrate. This Roman Catholic tradition, which marks the start of Lent, was brought to Brazil during the Portuguese colonisation of the 1500s. Already a popular tradition across Europe, Brazil added their own flair and feel, making it unique to their culture. Basically, Carnaval is one great big city-wide party that everyone is invited to. 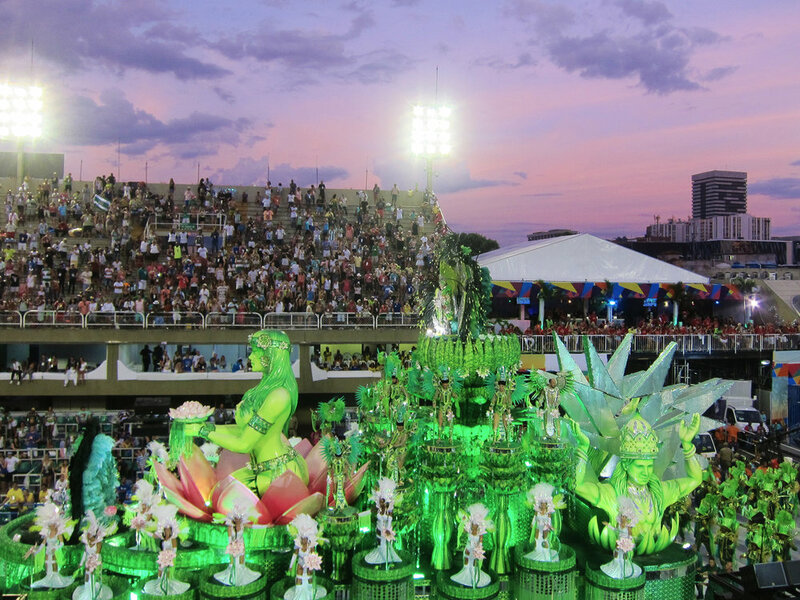 Rio de Janeiro's celebrations are by far the biggest, attracting millions from far and wide to join the week-long festivities. I was blown away by the colours, costumes and sheer scale of it all. The sounds of Brazilian beats and the feeling of samba dancing through the streets were surreal. A sensory overload to say the least! There was so much more to the experience than I'd imagined. Yes, there are samba dancers in stunning sequined costumes, but there's way more to it than just this image, which is marketed to the rest of the world. Let me quickly unpack it for you. Schools representing different neighbourhoods spend the year preparing and rehearsing a unique themed parade. 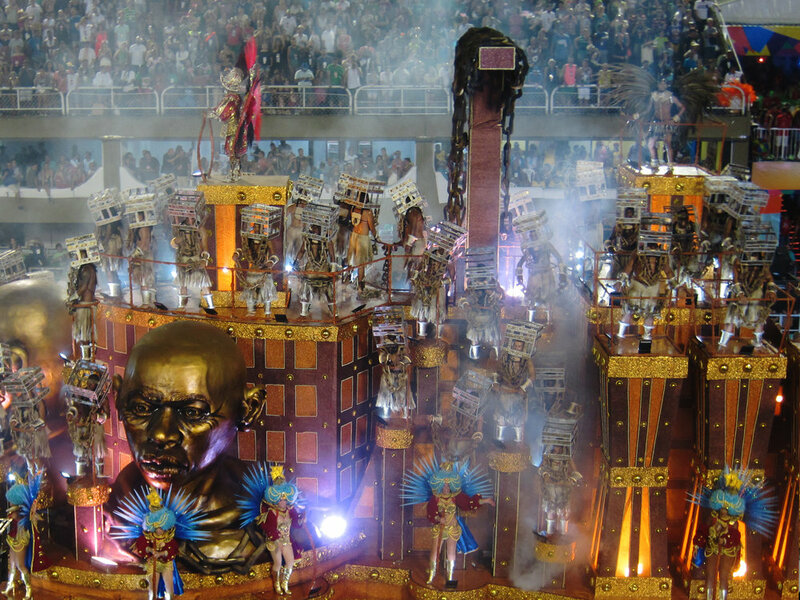 Given 80 minutes to perform along the Sambódromo strip, these highly-choreographed dance routines are turned into full-blown performances, embellished with firework displays, elaborate costumes and extravagant floats. With thousands competing and even more thousands watching (both in the Sambódromo and on TV), no elements of the performances go unnoticed. The schools are constantly upping their game, in the hope of entering the major league. It is the ultimate dance-off - pretty "samba-lievable" if you ask me! Sambódromo is not the place to go if you want to keep things short and sweet. My cousins Rachel, Daniel and I arrived at the Sunday night of the competition before sunset and stayed until after sunrise. Despite being tired, time seemed to slip away. Sure there were times where I felt tired as heck but I would've held my eyes open with toothpicks if I had to! We watched seven different performances, from politically charged pieces to a sea of shiny costumes and steam-shooting spaceships. 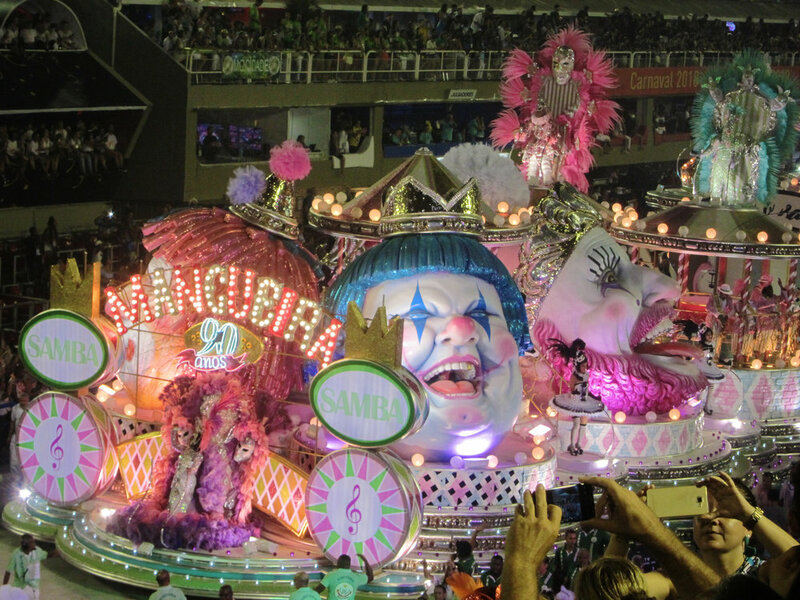 The unanimous favourite was Manguiera's eccentric carnivalesque parade. The performance was unbelievable, but the atmosphere made it a winner in my eyes. This school has a deep history and some insanely passionate pink and green wearing supporters – even at 5am! Ranging from 200 to over a million attendees, these organised street parties are the side Carnaval that you don't usually see in the marketing material. They are noisy, sweaty, glittery, smelly, and a claustrophobic's worst nightmare but totally worthwhile! They’re based on different themes and music styles: twerking funk performers, marching samba bands, nun-themed blocos, and even jaguar themed! Hundreds run simultaneously throughout the city for days on end. It's organised chaos and I love it! Most blocos are free but some are exclusive and come with a hefty price tag. To me, these defeat the purpose - people from all walks of life coming together to celebrate in the streets. During Carnaval, you'll find costumed Cariocas in every street, on the metro, and serving tables at restaurants. This tradition of "pretending" came about in days of old: men dressed like women, the upper-class dressed like commoners and the poor dressed like princes and princesses. When choosing an outfit, remember that Carnaval is not Coachella! It's no fashion parade and any expensive looking clothes and jewellery will make you a target for robbers. Unless you're performing in the Sambódromo, cheap and tacky is the way to go. This year's Carnaval was full of flower crowns, unicorn headbands, leotards, tutus, men in bridal veils and glitter – lots and lots of glitter! It is like a non-scary Halloween in the scorching heat. The coolest costume I saw was a guy inside a shower curtain with a functioning shower head above him that released water. How's that for some ingenuity to combat the extreme heat? What was my approach to costumes? Simple outfits, cheap accessories, makeup styles I'd never usually wear and, of course, bucket loads of glitter! While Rio Carnaval attracts a bunch of tourists, it’s for the Brazilians. They're very welcoming to those who want to join the party, but be respectful and don’t make a scene! It is their public holiday and part of their tradition. When you're in a bloco, it's every man for himself! There is no first aid and it's hard to get anywhere in the crowds. In bigger blocos, it's hard to find people once you've lost them. If you're in a group, pick a buddy and keep tabs on each other at all times. I’d recommend keeping your alcohol consumption low enough so that you're aware and alert at all times. Rio is a dangerous city and you have to remember that you don't know who anyone is, what they've brought with them or what they want to take from you. There are police around, but it is best to exercise caution at all times. There are so many robberies at Carnaval and the police won’t care if your phone and money are pinched. It’s best to leave valuables a home and just take a small amount of cash with you. My phone was pretty smashed up, so I wasn't too precious about it and took it anyway. If you bring your phone, just be careful about taking it out. Plan ahead! You'll need to pre-purchase Sambódromo tickets if you want to go, plan which blocos you want to go to and plan your transport. The metro stations often closed for cleaning and if you catch an Uber anywhere, you may end up stuck behind a bloco for 3 hours like I was! Rio in February is freakin' hot - pretty much always over 40 degrees Celsius/105 degrees Fahrenheit. Add in crowds of sweaty people, the temperature only elevates. Stay hydrated and be sun smart. You’ll find plenty street food vendors and many eateries stay open during the holidays, so there’s no need to go hungry. People at Carnaval are a whole lot more forward than I am used to. You may have sweaty, glittery strangers come up to you and ask for a "beijo". This means kiss, and you can politely decline if you do not want to. Bring a hand fan into the blocos. It helps with ventilation and fending off any unwanted "beijos". 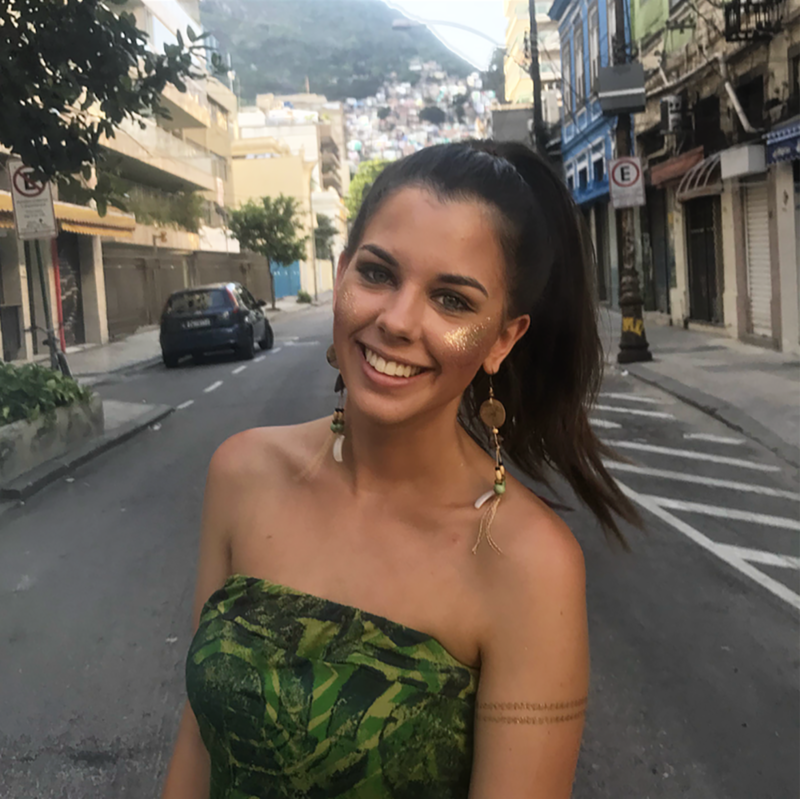 I'd highly recommend learning some Brazilian music and Portuguese phrases before you go. I didn't do this, but I was super lucky that my cousin speaks conversational Portuguese and is fluent in Brazillian music! Everyone sings along in the blocos so it's fun to know the words to the songs. Basically, just show some street smarts. Be super cautious, but not prissy or paranoid - get out there and have the time of your life!